SPRING DECORATING TRENDS. TIME FOR FUN! Spring is a time of renewal, when we break out of our winter doldrums.The smell of orange blossom, the cool mornings and evenings, and the warmer days get our hormones going. We are more active, colours seem brighter, the days are lighter and our energy increases. In furniture and decoration, the trend is towards vivid colours, blue, turquoise, mustard, fuchsia, and above all, coral! 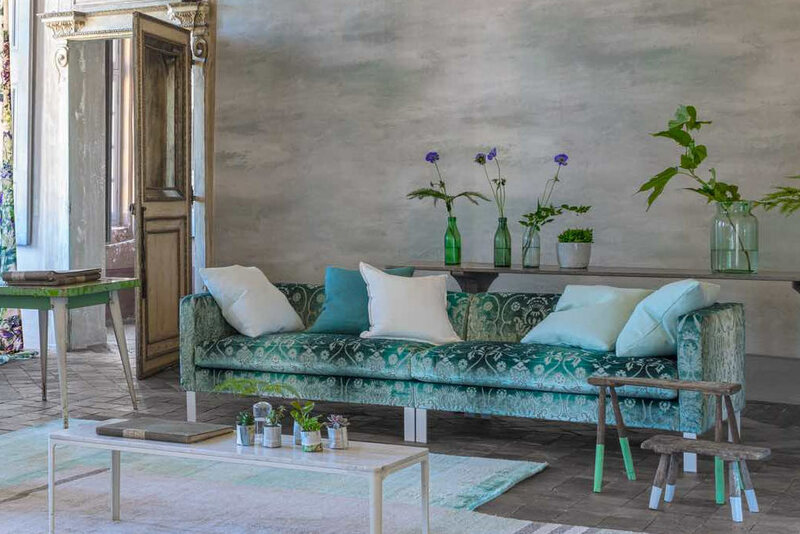 Wide or narrow stripes, fabrics and papers with flowers of every kind, we can bring spring into the home with, for example, the new Designers’ Guild collection, Seraphina. This spring very fine cottons and linens are in, drapey, worn, and very full. Satins add volume and combine daring colours in geometric motifs, or patterns imitating sections of pearlescent shells. There is a wide range of textures in synthetic fabrics, in animal prints and fantasy finishes, opening the doors of the imagination with impossible metallic colours for upholstery or cushions. We should change the idea that “if we change the curtains and upholstery we’ll have them for years.” It doesn’t have to be. Just as we dress differently in different seasons, our home should have options too. Don’t worry, you can store the heavy velvet curtains next to the blankets for next winter. Ceramic lamps in the shape of pineapples or plants are also on trend, with fibre lampshades. Don’t they remind you of the sculptures in the gardens at Versailles? The best thing this spring are the new patio furniture collections, such as Fendi’s Daisy, a circular recliner for two with a sunshade included, which can be pulled apart to create 4 seats. Manutti offers some lovely, very stylised outdoor furniture, including a new design line, Elements, with a platform under each piece of furniture with LED under-lighting, giving it a floaty quality. They have also surprised us with their new outdoor fabric collection, which resists all weather conditions. At Mobile Diseño you will find all of this and more, as well as personalised advice to suit your needs! Mobile Diseño, especialistas en mobiliario y decoración de interiores en Marbella y la Costa del Sol. Con más de 25 años de experiencia en el campo del interiorismo y la decoración, ofrecemos proyectos de calidad premium para los clientes más exigentes. Experts in interior design we carry out integral projects for particular and professional clients. Mobile Diseño creates customized design plans for all kind of needs with a guaranteed high quality result. Find the perfect home style with us. WHAT IS THE KITCHEN DESIGN THAT BEST FITS YOUR HOME? ©Copyright 2018 - Mobile Design All rights reserved.